A group of leading historians of medicine, science and the law from around the world gathered on July 24-25, 2015, at the London Global Gateway, to discuss and examine the topical issue of forensic science and medicine in a global and historical context. Ian Burney and Neil Pemberton—both from the University of Manchester’s Centre for the History of Science, Technology and Medicine—organized the conference with Christopher Hamlin, professor of history at Notre Dame. 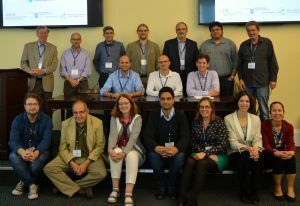 It was the third conference in a series addressing forensic science and medicine, and was co-sponsored by Notre Dame’s Institute for Scholarship in the Liberal Arts (ISLA), College of Arts and Letters, and John J. Reilly Center, as well as CHSTM and the Wellcome Trust. 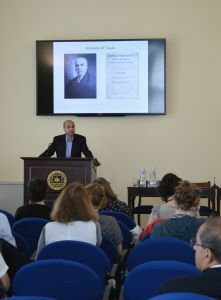 During the conference, 17 multidisciplinary speakers from universities around the globe presented papers that called into question what we now recognize as an infallible and unobjectionable science, considering how its role in society, acceptance as a science, and credibility depended on time, place, and cultural identities and unease, relating in particular to the British Empire and colonialism. The themes of the first day were detection, tracking, and tracing. The speakers considered the origins, development, and role of techniques such as forensic graphology, metric photography, blood testing and differentiation, blood spatter analysis, and tracking, and how they revolutionized crime investigations, and disproved false accusations and convictions. The second day dealt with issues of the changing roles of forensic pathologists, crime scene investigation and its ascendancy to the status of essential practice, the sharing of knowledge between forensic networks within the British Empire, poisonings and toxicology coming to the fore in crimes and the courtroom, the introduction of “scientific” policing methods in Europe, reforms in the forensic field in China, and practicing legal medicine. Originally published by Emily Grassby at international.nd.edu on September 23, 2015.